Thoughtful depiction of a Confederate camp as the soldiers consider the upcoming day. Limited edition, signed and numbered. If you don't want the frame, I can send you just the print which should save some shipping cost. THE SIZE IS 23"3/4 X 32". SLIGHT TONING ON THE OUTER EDGES FRAMING HIDE THIS ISSUE 8 CREASE LINES HERE AND THERE SEE LAST THREE PICTURES FOR EXAMPLES OTHERWISE THE CONDITION IS GOOD. Viper Venom by Robert Taylor. Aircraft: F-16 Viper. Overall Print Size: 34" x 23". S/N by Artist and Two (2) Pilots. Signed by Artist and Two (2) F-16 Pilots who flew in Desert Storm and Allied Force. UP FOR SALE IS THIS COLOR LITHOGRAPH BY ARTIST EDWARD MILLMAN. THE SIZE IS 22"X 28". THE CONDITION IS GREAT. SPECTACULAR LARGE SERBIAN PAINTING MILITARY BATTLE SUPERB DETAIL AMAZING!! Take a look at this stunning oil painting-Don't miss this piece Folks! Featured here is a very large and high quality hand painted oil painting depicting the Maiden of Kosovo. This is very fine oil painting copy of the famous painting originally done by Uros Predric. UP FOR SALE IS THIS COLOR LITHOGRAPH BY ARTIST ALEXANDER P. RUSSO. TITLED "BEACH ACTIVITY OMAHA BEACH". THE SIZE IS 22"X 28". THE CONDITION IS GREAT. UP FOR SALE IS THIS COLOR LITHOGRAPH BY ARTIST MITCHELL JAMIESON. THE SIZE IS 22"X 28". THE CONDITION IS GREAT. UP FOR SALE IS THIS COLOR LITHOGRAPH BY ARTIST DWIGHT SHEPLER. TITLED "GENERAL QUARTERS AT DAWN". THE SIZE IS 22"X 28". THE CONDITION IS GREAT. UP FOR SALE IS THIS COLOR LITHOGRAPH BY ARTIST ALBERT K. MURRAY. THE SIZE IS 22"X 28". THE CONDITION IS GREAT. UP FOR SALE IS THIS COLOR LITHOGRAPH BY ARTIST GRIFFITH BAILY COALE. TITLED "AIR ATTACK ON JAPANESE CARRIERS KAGI AND AKAGI". MIDWAY BATTLE. THE SIZE IS 22"X 28". SLIGHT WEAR AND TONING ON THE OUTER EDGE FRAMING HIDE THIS SEE LAST PICTURE OTHERWISE THE CONDITION IS GREAT. UP FOR SALE IS THIS COLOR LITHOGRAPH BY ARTIST MITCHELL JAMIESON. THE SIZE IS 22"X 28". SLIGHT STAIN ON THE VERY BOTTOM EDGE FRAMING HIDES THIS ISSUE OTHERWISE THE CONDITION IS GREAT. UP FOR SALE IS THIS COLOR LITHOGRAPH BY ARTIST WILLIAM F.DRAPER. TITLED "GENERAL QUARTERS". THE SIZE IS 22"X 28". SLIGHT WRINKLE ON THE CORNER OTHERWISE THE CONDITION IS GREAT. UP FOR SALE IS THIS COLOR LITHOGRAPH BY ARTIST MITCHELL JAMIESON. TITLED "REFUELING DESTROYERS". THE SIZE IS 22"X 28". SLIGHT WRINKLE ON THE CORNER OTHERWISE THE CONDITION IS GREAT. 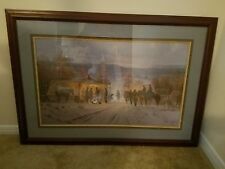 STAN STOKES "VIETNAM WAR VETERAN" HAND SIGNED LIMITED EDITION LITHOGRAPH C.O.A. UP FOR SALE IS THIS LIMITED 831/4250 EDITIONS COLOR LITHOGRAPH HAND SIGNED AND NUMBERED IN PENCIL BY ARTIST STAN STOKES. TITLED "VIETNAM WAR VETERAN". THE SIZE IS 11"1/2 X 16". THE CONDITION IS GREAT. Signed in Pencil by the Artist as well as 17 Flying Veteran Signatures. THE SIZE IS 22"X 28". THE CONDITION IS GREAT. STAN STOKES "THE RINGMASTER" HAND SIGNED LIMITED EDITION LITHOGRAPH WITH C.O.A. UP FOR SALE IS THIS LIMITED 831/4250 EDITIONS COLOR LITHOGRAPH HAND SIGNED AND NUMBERED IN PENCIL BY ARTIST STAN STOKES. TITLED "THE RINGMASTER". THE SIZE IS 11"1/2 X 16". SLIGHT FOXING IN THE MARGINS OTHERWISE THE CONDITION IS VERY GOOD. 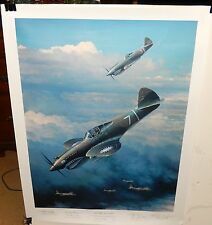 STAN STOKES "NIGHT RAIDERS" HAND SIGNED LIMITED EDITION LITHOGRAPH C.O.A. UP FOR SALE IS THIS LIMITED 831/4250 EDITIONS COLOR LITHOGRAPH HAND SIGNED AND NUMBERED IN PENCIL BY ARTIST STAN STOKES. TITLED "NIGHT RAIDERS". THE SIZE IS 11"1/2 X 16". THE CONDITION IS GREAT. STAN STOKES "HURRICANE ON MY TAIL" HAND SIGNED LIMITED EDITION LITHOGRAPH C.O.A. UP FOR SALE IS THIS LIMITED 831/4250 EDITIONS COLOR LITHOGRAPH HAND SIGNED AND NUMBERED IN PENCIL BY ARTIST STAN STOKES. TITLED "HURRICANE ON MY TAIL". THE SIZE IS 11"1/2 X 16". THE CONDITION IS GREAT.